While everyone is posting dishes with pumpkins at this time of the year, I have a different fruit that is taking up too much space on my kitchen counter. Yes, with the arrival of Mr. Jack Frost, I had to pluck all the tomatoes while they were green. 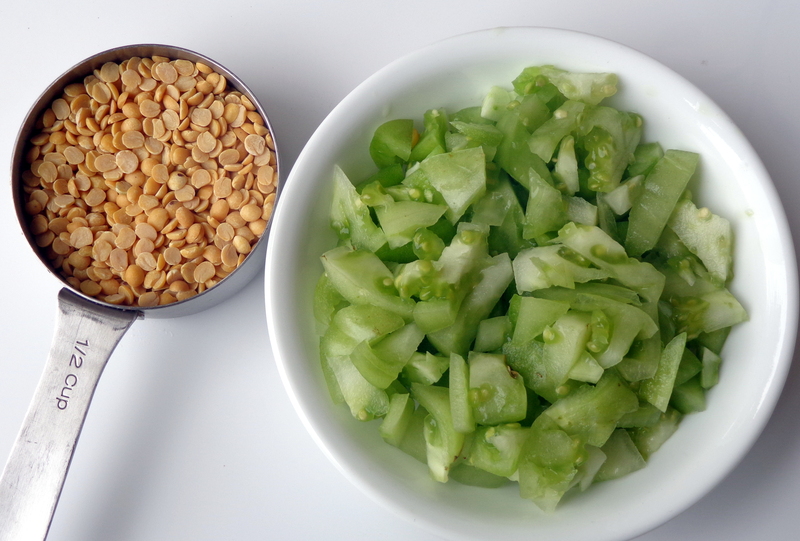 Time for recipes with the sour but tasty green tomatoes! 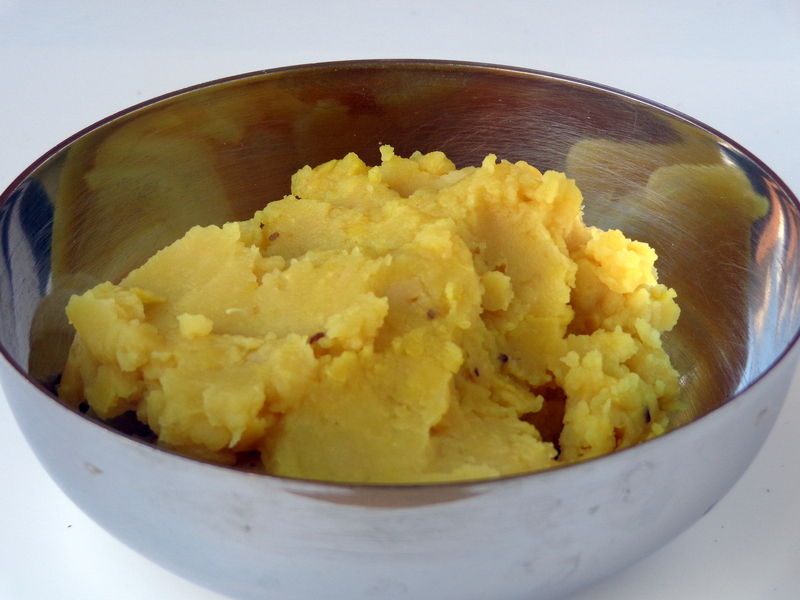 ‘Masial’ is a fragrant and protein-rich south Indian dish that is made with slightly sour vegetables cooked with mashed pigeon peas or toor dal and spices. It is served as a side to rice in the main course. In my house, we have it with brown rice. 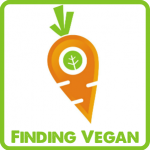 Sharing this at VVLP 18 at Annie’s blog An Unrefined Vegan, co-hosted by Poppy and Angela. This is also one of the green tomato dishes that I’m taking to Fiesta Friday #40 at The Novice Gardener’s co-hosted by Jhuls and Margy. 1. 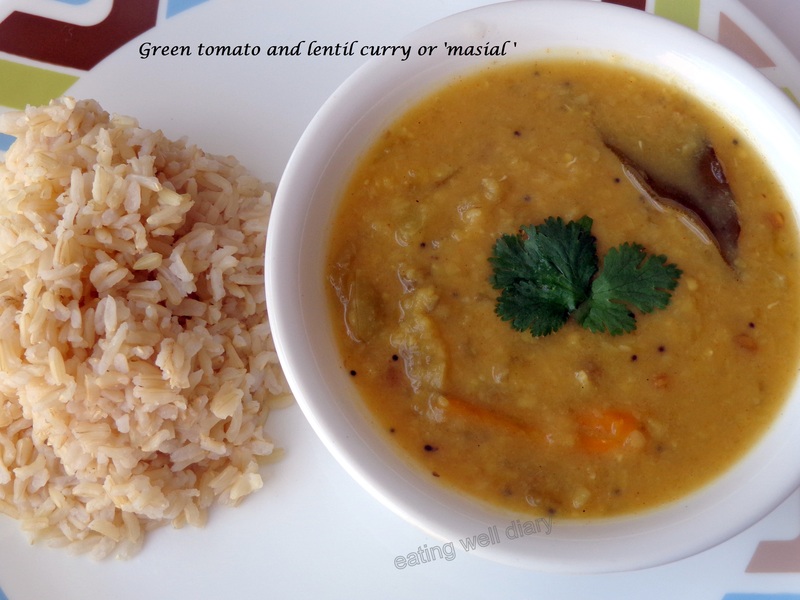 Cook lentils (with turmeric powder) separately with 2 cups of water. I use a pressure cooker for this purpose. 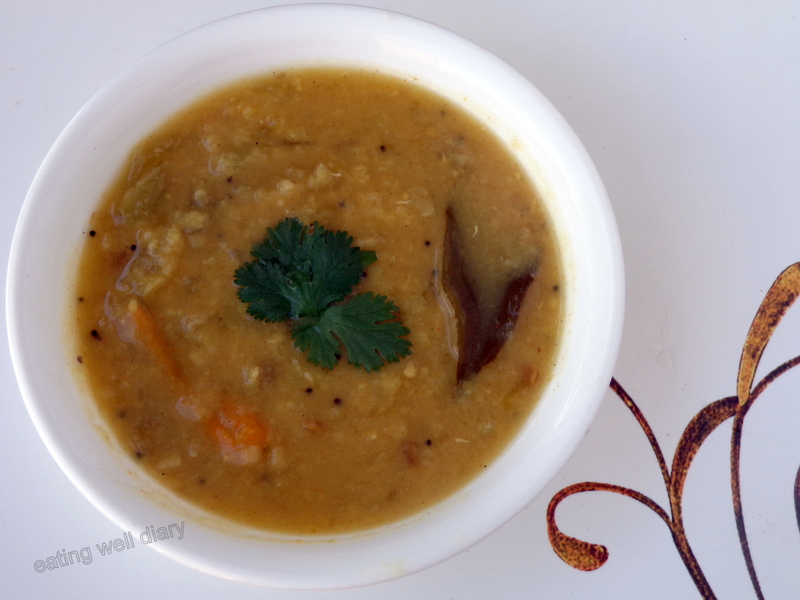 Once done, the dal should be of mashable consistency. If not, cook again with more water. Once cool, mash it with the back of a soup ladle. 2. Chop tomatoes into small pieces and slit green chilly lengthwise. 3. In a heavy bottomed pan, heat oil. Add mustard seeds and asafoetida powder. When they spatter, add fenugreek seeds, curry leaf, slit green chilly and chopped tomatoes. 4. Add water and salt, close the pan and cook till tomatoes are very tender. 5. Add sambar powder and lentils and additional water. Bring to boil a couple of times. 6. 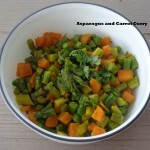 Garnish with cilantro and serve hot with rice. beets and mixed vegetables in coriander gravy- curry as a side with flat breads or brown rice! 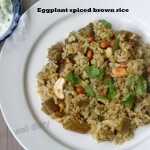 It is surprisingly easy and tasty too, Chitra. thank you! sounds interesting. Is it very tangy? Bcoz green tomatoes generally are. I have never used green tomatoes before, recently at a dinner party I asked the hostess what kind of chatney she had made, she said it was from tomatoes…I was puzzled because the color was a light lime green and she explained it was from Green tomatoes which she brought out a few from the kitchen…needless to say I was excited by this new type of tomato! 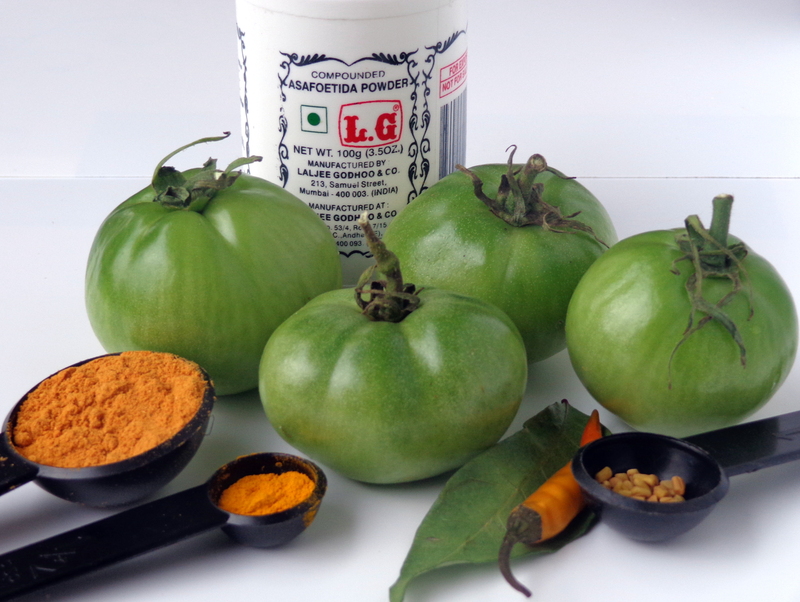 Wow, have never heard of green tomatoes in Indian cooking :)), there’s always a first eh! and your recipe sounds delicious! I had so many green tomatoes and just let them go to waste. Now I have an option next year! Love this recipe! The comfort food I’d need for this cold Sunday! Thanks a lot for sharing with us at FF!